As Milan is considered to be the capital city of Italian fashion, shopping in this city is something that nobody can avoid, for the outstanding number of shops, galleries, boutiques, ateliers and showrooms that highlight the latest trends in every aspect of the fashion industry. And for those who have a passion for vintage, antiques and artistic objects, there are markets, laboratories and homemade galleries to blow your mind away. In fact, even though it is mostly famous for its labels and fashion houses, Milan has much to offer in terms of casual fashion, handicraft, home décor, design, anything that might suit anybody’s needs and curiosity. Let us start then with an overview of the most important places where to go shopping in Milan. This is an area just behind the Cathedral, which is named after its shape of a quadrilateral and is completely dedicated to luxury shopping. Four streets ideally form the quadrilateral: Via Montenapoleone, Via Manzoni, Via della Spiga and Corso Venezia. All of them are lined up with luxury shops, jewelleries, stilists’ showrooms, such as Valentino, Prada, Dolce&Gabbana, Versace, Armani, Tiffany, Gucci, Chanel, Cartier, all the excellence of fashion industry both from Italy and from abroad. This place is lively and always changing, introducing to its elegant public new tendencies, ideas and materials by their favourite stylists. Via Montenapoleone is the most famous of these four streets and is dedicated to luxury shopping since the Fifties, when many Italian fashion designers decided to open their ateliers in this street and make it the most elegant and snobbish of the whole city. It can answer to any desire in terms of clothing, accessories, jewellery, but for many these shops stay just as something beautiful to look at, as luxury comes with a high price indeed. 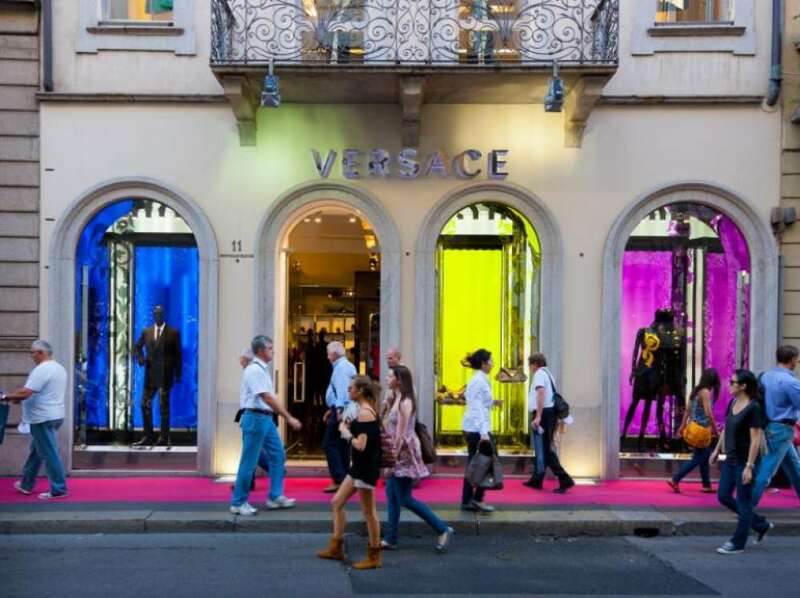 Nevertheless, in via Manzoni you can buy luxury without spending a fortune: D Magazine Outlet is a place where they sell clothing from labels such as Armani and Versace, organised alphabetically, half price. Definitely worth a visit. Also, following Corso Venezia in the opposite direction from the city centre, the street changes its name in Corso Buenos Aires, which is a very famous shopping street as well, but not for luxury only. In fact, you can find either brands and expensive shops or casual clothing, shoes and accessories. This street is more than 1 km long, so there is plenty of shopping possibilities for anybody. Getting to Quadrilatero della Moda area is very easy: you can either walk from the cathedral square, which is only 1 km away, or take the metro: there are two stops in this area, Montenapoleone stop on M3 line (yellow) and San Babila stop on M1 line (red). Corso Buenos Aires is farther from the cathedral square and it is served by three metro stops along its length: Porta Venezia (M1 line, red), which is at the very beginning of this avenue; Lima (M1 line red too), which is at about halfway on the Corso Buenos Aires; Loreto (M1 and M2 lines, red and green), which is at the end of it.